The Love of things Gold. The new Trulli table lamp is a strong and confident, lustrous piece, with curvaceous and sculptural beauty and a winning glow. Trulli is a truly eye catching piece. It is elegant, sculptural, sophisticated, peaceful and beautiful. 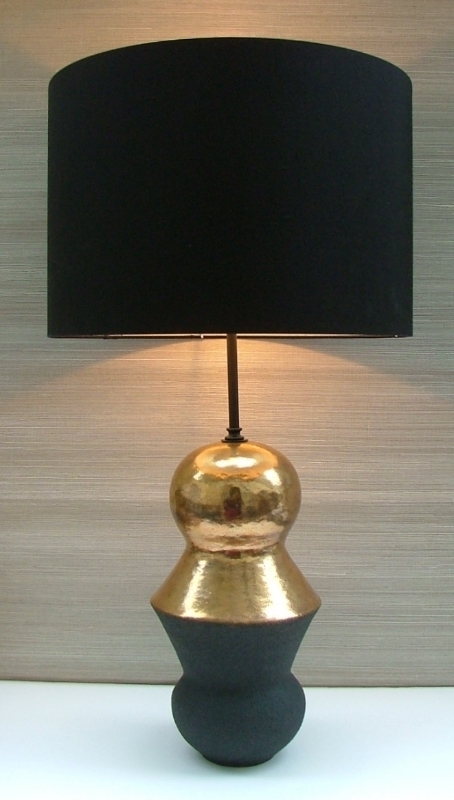 A lamp with real personality that would quietly take centre stage to a neutral scheme. A real ‘Gem in the Room’ with timeless style. It was the tactile quality of Sotis Filippides’ pieces that drew us to his work. Sotis designed our Trulli lamp with reflective light and contrast in mind. The luminous gold leafed cupola is balanced with the dark, matt base, creating the impression a reflective shadow below. The top half being smooth, bright and radiant, and the shadowy base organic and textured. An exhilarating contrast designed with a sense of the exotic. Trulli stands at 84cm high including shade. Remember that we can customize most of our designs. This sculptural curvaceous piece can make a decorative statement at a size that suits your design scheme. Art, lighting and textures all in one, elements that make a room exquisite. This piece also comes in a platinum finish, just as vibrant and reflective, but with more of a silvery glow. Equally a magnificent finish with real depth and iridescent quality. The clever mix of textures and surfaces can come in other colours. 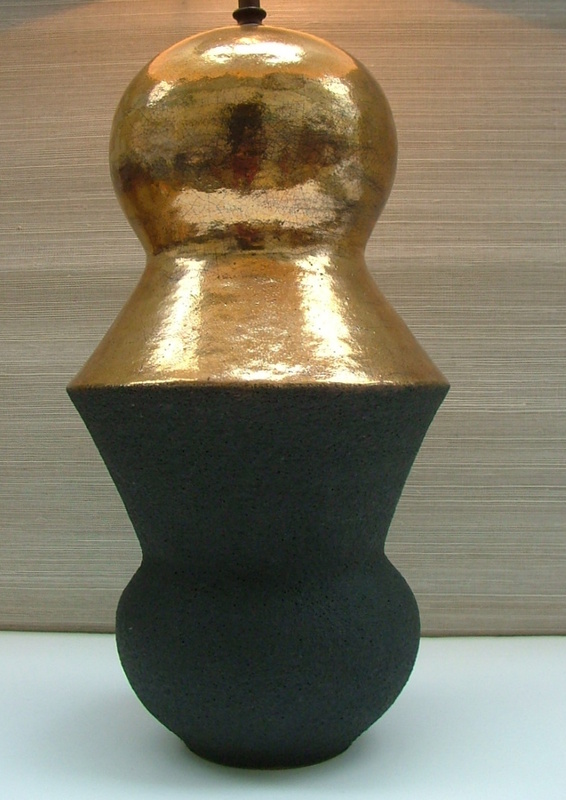 As well as the gold and platinum, the shining bright top can be finished in a soft coloured contrasting glaze. From left to right in the image below. Chalky White, Platinum, Soft Sky Blue and Celadon. 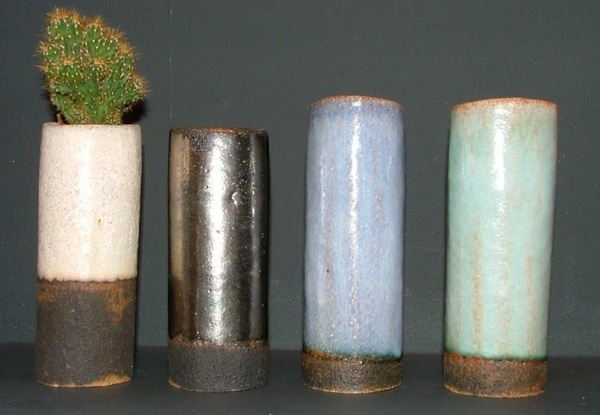 All the glazes have that beautiful tactile quality that is Sotis’ trademark. 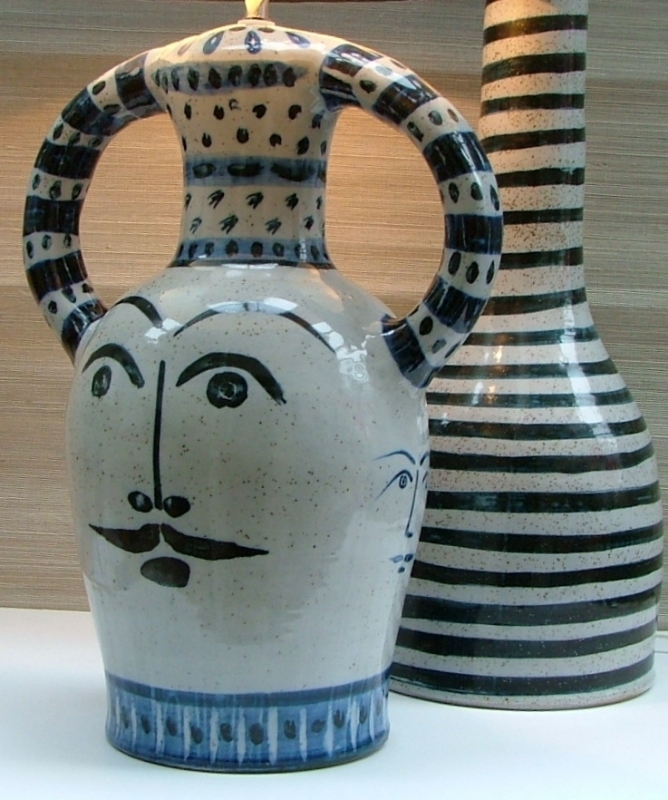 Blue and white is proving to be an interiors trend, if you missed our last newsletter about our new blue and white hand painted contemporary ceramics, with their playful images reminiscent of the currently fashionable Mediterranean artists that were working in the 1960’s and 1950’s on the French Riviera, then Click here for more information. Bold, bright and full of energy, these lamps create an impact and stand at impressive heights.